Cuisine is the expression of culture and local lifestyle. Therefore, if you want to know a region or a country you need to discover its culinary aspect too. In this way, your travel is completed. On the other hand, Hanoi – the place with thousands years of history is the capital of Vietnam. From long time ago, many people from all over the country flocked into Hanoi to reside. They not only brought their family but also their culture and their cuisine, which create a Hanoi with the diversity of food now. 1. 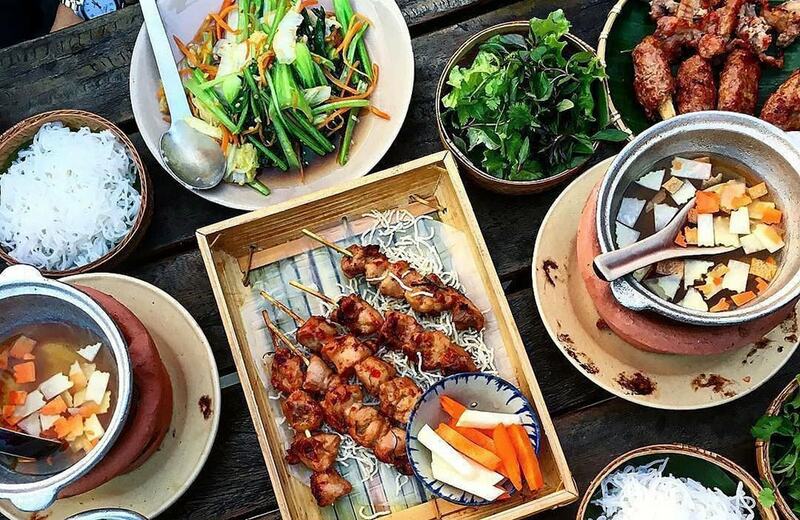 Why you should take a street food tour in Hanoi? People say that when in Rome, so as the Roman do. So when you are in Hanoi, eat like Hanoian. Discover a city isn’t about visiting its popular places or take part in some traditional shows. It’s living like a local. 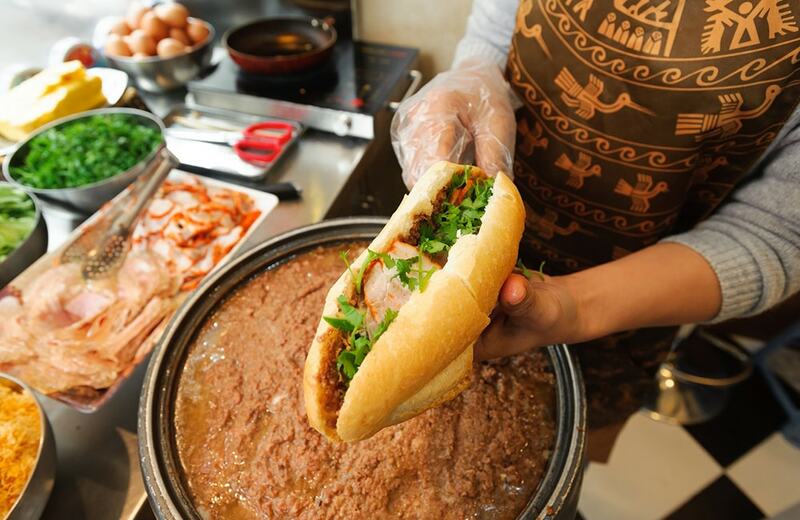 With Hanoi street food tour you will know what Hanoian eat for breakfast, why they drink coffee after breakfast, how to eat different kind of dish. These are the most important things you should know about one country. Vietnamese diet focus on the balance of nutrition. That’s why they always combine lots of fresh ingredient. For instance, when you have Pho you intake carb from rice noodle, protein from beef and fibre from veggies and herbs. All these ingredients are in one bowl. Therefore, you will have healthy meals with Hanoi street food tour. As I mentioned above, there are some small street food stalls where they have bought for a long time from this generation to others with secret recipes. Even though they don’t have a restaurant, but their dish is unique which offer you authentic taste. And spend one day on Hanoi street food tour for these stalls is a sensible choice. This is a popular dish in Hanoi. You can easily find many places offering this dish from in restaurants to small stalls on the street. It is the combination of BBQ pork and vermicelli mixed together in a bowl of fish sauce and herbs. 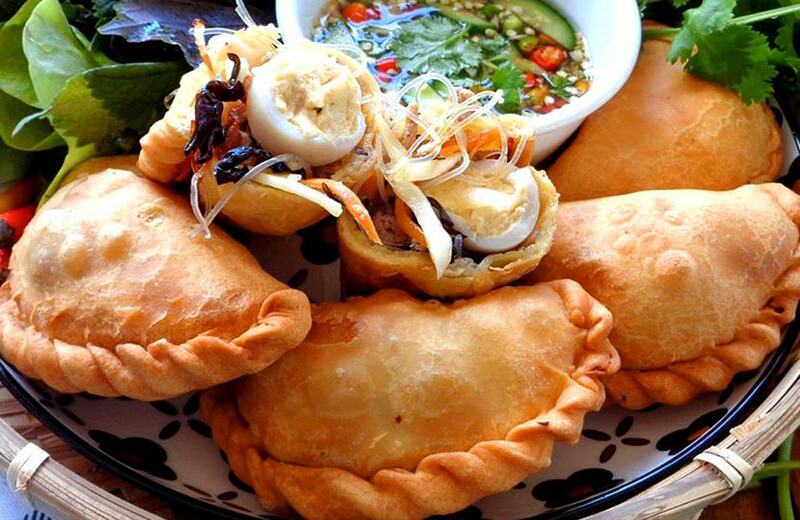 This dish is kind of snack in Vietnam. People tend to eat it at night like supper. If you start your Hanoi street food tour at Hanoi Old Quarter, you should try it first. You can find lots of places near Hoan Kiem Lake offering this dish. It is consists of papaya, carrot, peanuts, lemon juice, slices dried beef and lots of mint and basil. It’a a great feeling when you can taste different flavors: sweet, sour, spicy,… in only one dish. You will want eat more but don’t do that because there are so many dishes waiting for you. 66 To Hien Thanh Street, Hai Ba Trung District. 101 Ba Trieu Street, Hai Ba Trung District. 25 Thai Phien Street, Hai Ba Trung District. 12-14 Hang Ga Street, Hoan Kiem District. Cha ca is great for dinner. It is the white fish seasoned with garlic, turmeric,… then fry a little before being served on a pan. You also are served with vermicelli, herbs, peanuts, sauce. 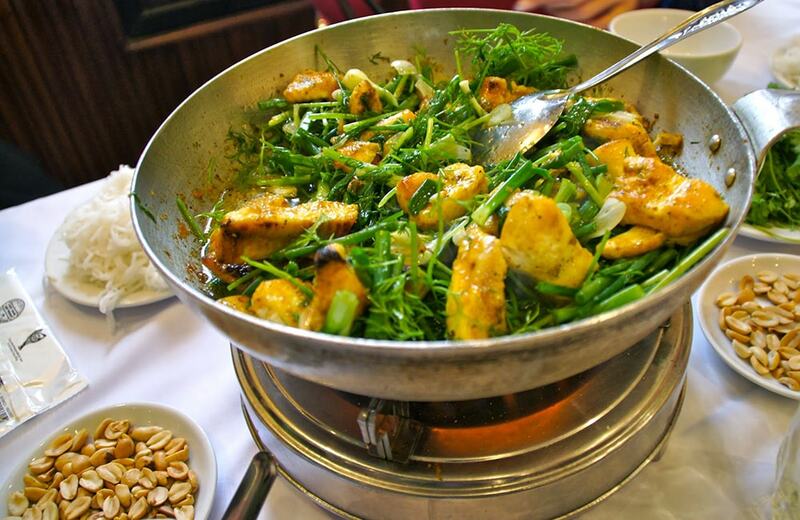 This dish is very popular among locals, so there is no reason to miss it when taking Hanoi street food tour. You might feel like vermicelli is main ingredient in lots of Vietnamese dishes. Yes, it might be, but enjoy rice noodles with various way and various combinations can create a brand new taste. Bun thang is the combination of vermicelli, pork, chicken, egg and herbs. The vendor told me that the broth is made from almost 20 ingredients like: shrimp, ginger, mushroom, fish sauce,… I can’t remember all. 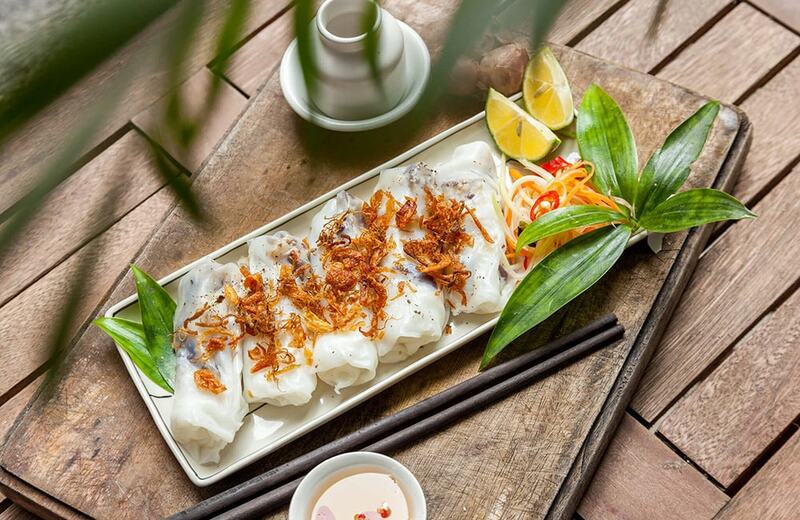 This pillow-shaped dumpling contains glass noodles, wood ear mushrooms, pork, steamed quail egg and is served with sauce made from fish sauce, garlic, sugar, lime juice, chili and a little slice papaya and carrot. You might think it will be greasy because it is deep fried, but you are also offered lots of veggies. 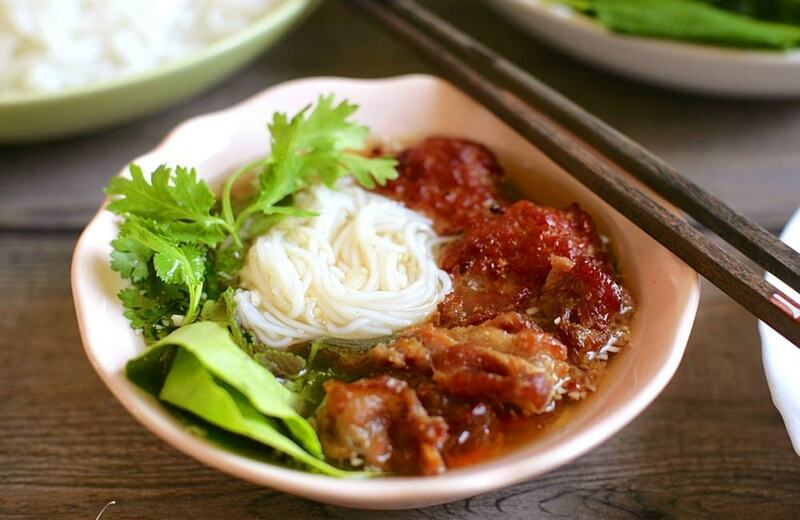 Traditional dish of Hanoi can’t be missed in your Hanoi street food tour. 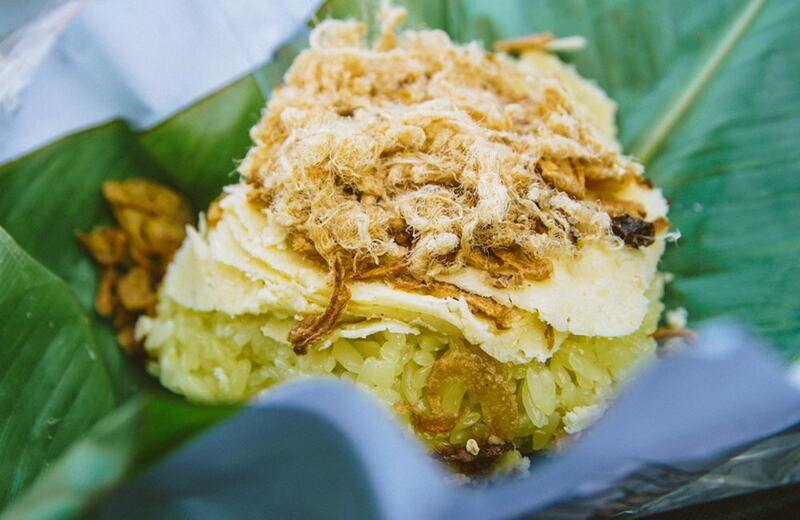 Every bowl of sparkling yellow sticky rice with mung bean and fried onions draws your attention right way. Xoi xeo is typical breakfast of Hanoian. Lots of people can eat it everyday. Don’t forget order a glass of soy milk. They are a good companion which completes your meal. Try Xoi Yen at 35b Nguyen Huu Huan for the best in Hanoi. Here comes the dish most expected in this list of Hanoi street food tour. And it is also the dish that you can eat all day in Vietnam. I realize that the thing make Pho become unique and different in various restaurants is the broth. 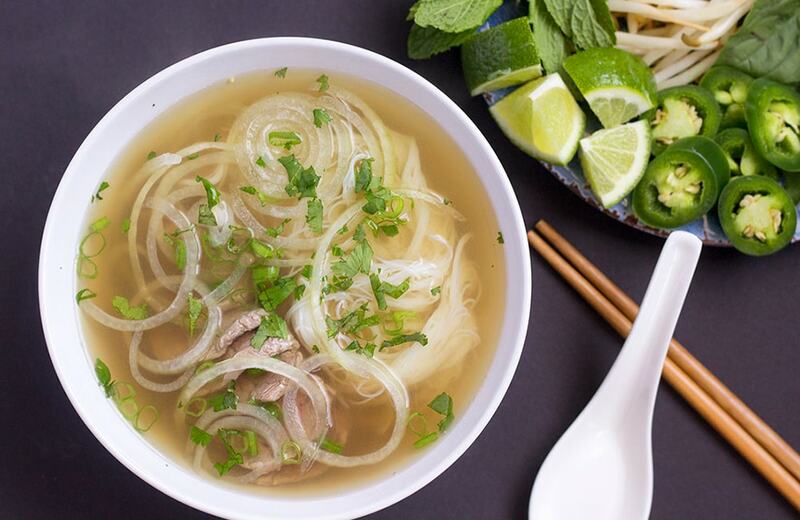 With a secret recipe, the broth – the soul of Pho creates the instinctive feature of each brand. This dish contains Pho (rice noodles), chicken or beef, some onions, veggies. It is sold with different prices from 30.000 to 50.000 VND. You can come to Pho 10 at n.10 Ly Quoc Su, Hanoi or any stall you come across in the street. It sounds quite curious, right? 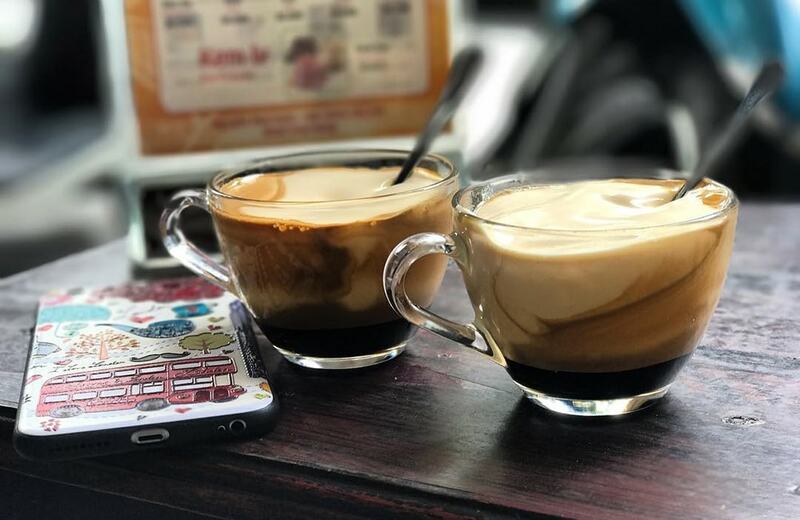 It is a combination of egg yolk, sugar, condensed milk and coffee.The recipe for this drink is unique and only one coffee shop can offer you the authentic taste. In Giang Café, no.39 Nguyen Huu Huan, Hanoi you will have the greatest egg coffee. This list can be extended more, which depending on one’s taste. These dishes are only my suggestion for Hanoi street food tour. If you find out any other delicious dishes out of this list, don’t forget to leave your comment.